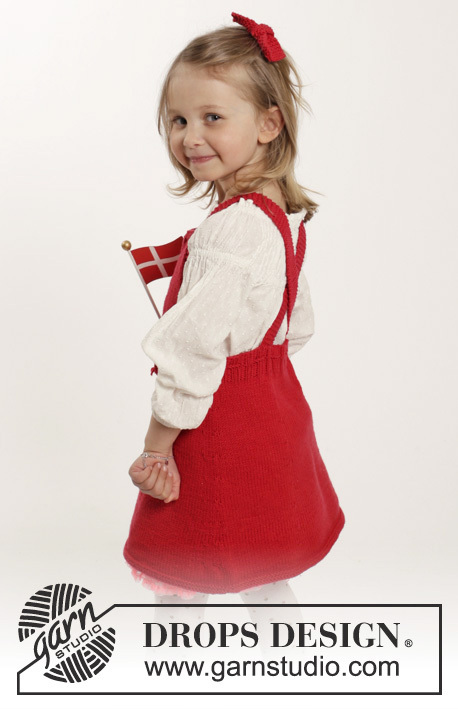 Go to original pattern for design DROPS Children 26-4. 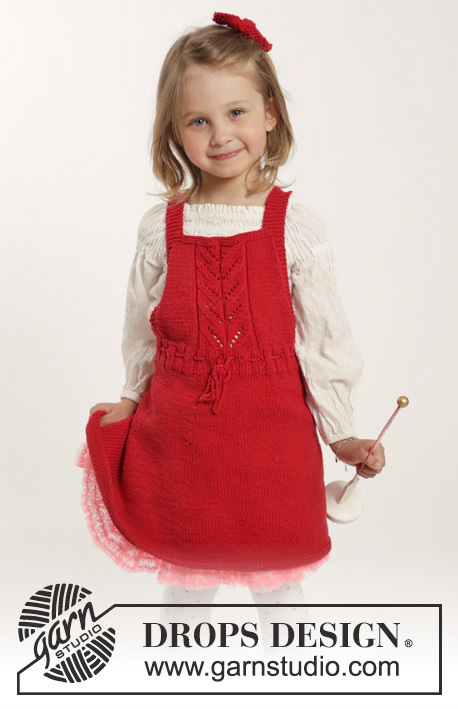 Knitted dress with lace pattern and hair bow in garter st, in DROPS Cotton Merino. 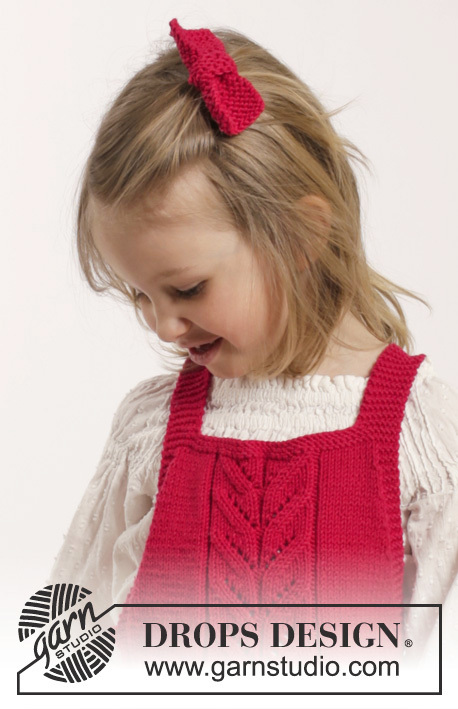 For baby and children in sizes 1 month - 6 years. DROPS CIRCULAR NEEDLE (80 and 40 cm) SIZE 3.5 mm - or size needed to get 22 sts x 30 rows in stocking st = 10 x 10 cm. DROPS CIRCULAR NEEDLE (80 cm) SIZE 3 mm – for rib. 50 g colour no 06, red (small bow weighs approx. 6 g and large bow weighs approx. 10 g). DROPS STRAIGHT NEEDLES SIZE 3.5 mm - or size needed to get 22 sts x 45 rows in garter st = 10 x 10 cm. ACCESSORY: Silk ribbon or hair pin for fastening the bow. 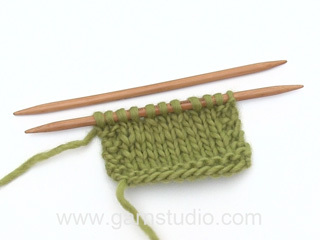 You can get the yarn to make this pattern from	13.60£. Read more. See diagrams A.1, A.2 or A.3. The diagrams show all rows in pattern seen from RS. See diagrams for desired size. Size 1/3 + 6/9 months: Work A.1. Size 12/18 months and 2 years: Work A.2. Size 3/4 and 5/6 years: Work A.3. Dec 1 st as follows after 1st, 2nd, 4th and 5th marker: Slip 1 st as if to K, K 1, psso. Dec 1 st as follows before 3rd, 4th, 6th and 1st marker: Beg 2 sts before marker, K 2 sts tog. All dec are done from RS! Dec as follows after 4 edge sts in garter st: Slip 1 st as if to K, K 1, psso. Dec as follows before 4 edge sts in garter st: Beg 2 sts before 4 edge sts and K 2 tog. When piece measures 4 cm, dec 1 st on each side of 1st and 4th marker, dec 1 st after 2nd and 5th marker and 1 st before 3rd and 6th marker – READ DECREASE TIP (= 8 sts dec). Repeat dec every 2½-3-3 (3-3-3½) cm 7-7-8 (8-9-9) times in total = 96-104-112 (124-132-140) sts. 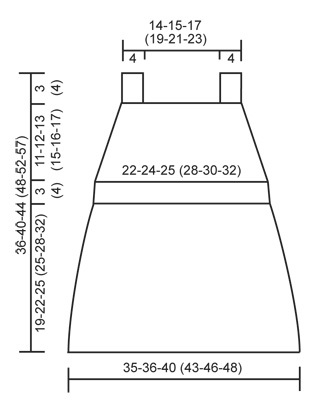 Continue in stocking st until piece measures 19-22-25 (25-28-32) cm. Switch to circular needle size 3 mm and work rib in the round as follows: K 1, * P 2, K 2 *, repeat from *-* until 3 sts remain on round and finish with P 2 and K 1. When rib measures 1½-1½-1½-2-2-2 cm, work lace edge as follows: K 1, * P 2 tog, 1 YO, K 2 *, repeat from *-* until 3 sts remain on round, finish with P 2 tog, 1 YO and K 1. 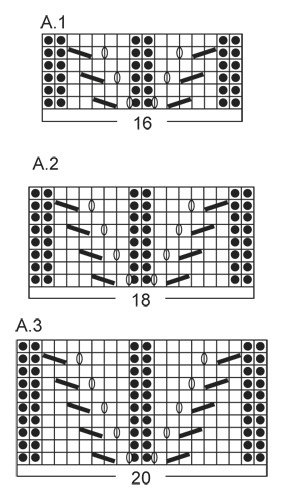 Work until 1 round remain before rib measures 3-3-3-4-4-4 cm. Work next round as follows: Work rib over the first 48-52-56 (62-66-70) sts (= front piece), LOOSELY cast off the next 48-52-56 (62-66-70) sts with K over K and P over P (= back piece). Insert 1 marker – NOW MEASURE PIECE FROM HERE. Switch to circular needle size 3.5 mm and work first row from RS as follows: 4 edge sts in GARTER ST – see explanation above, 12-14-15 (18-19-21) sts in stocking st, work pattern according to diagram A.1, A.2 OR A.3 (see diagram for your size = 16-16-18 (18-20-20) sts), 12-14-15 (18-19-21) sts in stocking st and 4 edge sts in GARTER ST. Continue pattern back and forth like this, AT THE SAME TIME after 1 cm, dec 1 st in each side - READ DECREASE TIP 2. Repeat dec in each side every 1-1-1½ (1½-1½-1½) cm 9-9-9 (10-10-10) times in total = 30-34-38 (42-46-50) sts remain. When piece measures 11-12-13 (15-16-17) cm from marker (adjust so that next row is from RS), work 3 ridges back and forth over all sts. Work next row as follows from RS: K 8 and slip these sts on 1 stitch holder for shoulder strap, cast off the next 14-18-22 (26-30-34) sts and K the last 8 sts (= shoulder strap). Continue in garter st back and forth until shoulder strap measures approx. 18-25 cm (or desired length). Cast off and repeat in the other side. Sew strap to rib at the back of dress. Cut 2 lengths Cotton Merino yarn of approx. 3 metres each. Twine the strands tog until they resist, fold the string double so that it twines again. Make a knot at each end. Beg mid front and thread tie up and down through eyelet row on rib in waist. Numbers in ( ) applies to large bow. Cast on 10 (20) sts on needle size 3.5 mm with Cotton Merino. Work in GARTER ST – see explanation above – back and forth until piece measures 8 (12) cm, cast off. 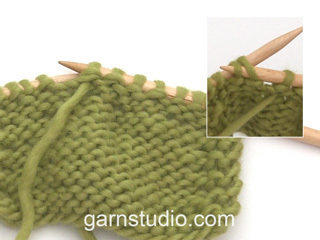 Cast on 10 (15) sts on needle size 3.5 mm and work 4 (5) ridges. Cast off. 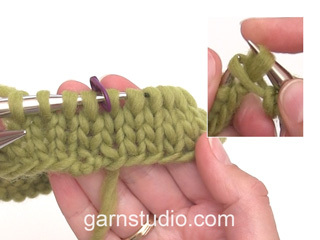 Sew the short ends tog to form a ring. Pull the bow through the ring and fasten the two parts tog with a couple of stitches. 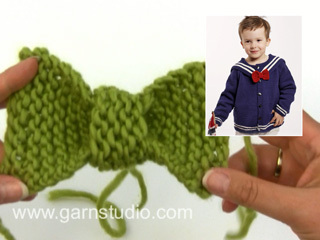 Fasten bow with a silk ribbon or a hair pin with a couple of stitches. Pour faire un 8 ans comment faire ? Bonjour Mme Daoust, ce modèle est uniquement disponible jusqu'au 5/6 ans, nous ne sommes malheureusement pas en mesure de pouvoir ajuster chaque modèle à chaque demande individuelle, n'hésitez pas à contacter votre magasin ou un forum tricot pour toute assistance complémentaire. Bon tricot! Beste drops, Ik heb een vraag over het jurkje en over het minderen. Ik brei de maat voor 2 jaar. Ik moet dus iedere 3 cm minderen rondom de markeerders 8x in totaal. Dat is 8x3=24cm + de 4 cm voor de eerste mindering. Dan zit ik in totaal aan 28 cm, dat terwijl het eerste deel 25 cm moet meten. Kunt u dit voor mij ophelderen? Bedankt! Thanks again for another very speedy reply :) Think I am with you, not sure why I am so confused :) I will use measurements on schematic for chest/waist size, measurements the top of the page is the length/height. I wouldn't mind but I have used a lot of your other patterns with no problems! Anyway, thanks again, love this pattern & can't wait to start (and so many others, just need more time!) K.
Hi, thanks for the reply. I have measured the size I need is 21" / 53.3 (approx. cm). My question is, which size do I use - the "size in cm" or the sizes given in the schematic. For 12-18 months the "size in cm" is 80/86 cm and the size in the schematic is 25cm (x2 =50cm). I am just wondering which of your sizes I would go with to get my desired 53/54 cm. Thanks again. Dear Katie, the size (80/86 cm) is meant stature in cm - the 25 cm ( x 2 = 50 cm) in 3rd size are for the width. There will be some rib at waist, so that you can easily adjust, checking measurement from a similar garment. Happy knitting! Hi, my daughter measures 21" around the chest approx. 53cm. Going by the "size in cm" that would mean I should make the 1-3 months but if I look at the schematic the chest size for 1-3 months is 22cmx2=44cm so I should go with either 12-18 months - 25cmx2 or the 2 years - 28cmx2. Sorry if this is a bit confused, a steer in the right direction would be appreciated. Thanks so much. Dear Katie, the best is to measure a similar garment she has and compare with the measurement chart - read more here. Happy knitting!